Oh, only now I noticed those Cagliostro diorama kits (or whatever they're called x_x) of yours. So tiny~♥ I browsed around them on auctions not too long ago but decided not to invest. I'm still not too thrilled about painting figures myself. and here is a website with pictures and details of some of the other kits: http://www.1999.co.jp/eng/10012888. Lazymez I hope you are able to work out a way or a place to display some of those Lupin figures you are 'drowning' in because the idea of keeping them all locked up in storage just makes me sad. Even if you are only able to hang one three foot shelf, it can still go a long ways to brightening up your environment with toys. Good luck! If you're telling me those small ones are simply gashapons, I think what I've seen might be unofficial garage kits of those or something. Seller had photos of open box with unpainted pieces (i.e scene with Lupin pulling Clarisse outside the window). I think I need to try to find those auction items again when I have time. It was weeks ago when I saw them, tho, so I'm not sure if I can find them again. I'm somewhat familiar with those GSI Creos Cagliostro kits you mentioned. You see those once in a while on auctions. Hopefully you'll get that one sooner or later home, it looks pretty detailed with all those small articles :D If I ever decide to try out unpainted models, I think they'll be from Sailormoon. They look simple enough and completed Sailormoon PVC models have no real variety on second hand market. Anyway here's a comparison shot of one of the Bandai Gashapons with its source material. You talk about detail with the 1/12th scale model kits, well I think Bandai is pretty impressive to at a much smaller size! I stuck a penny in there for size check. 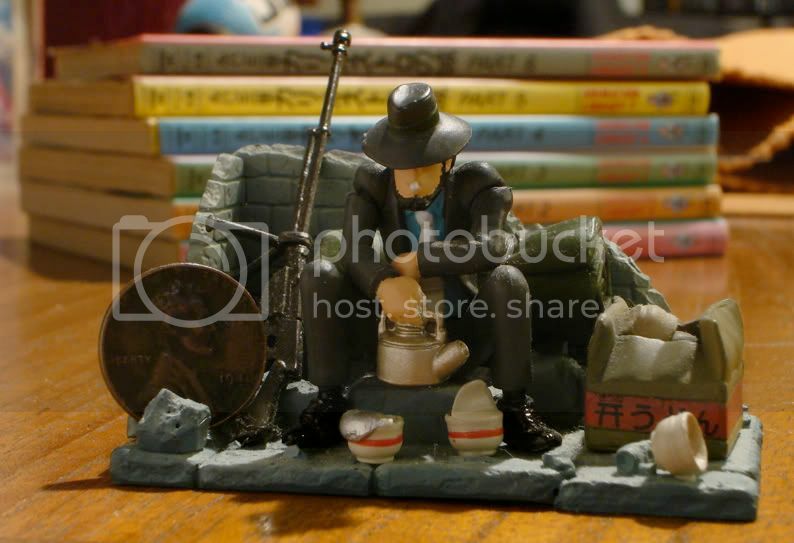 Note that this diorama is part of the same set that includes the one of Lupin pulling Clarisse through the window. I've seen this set listed on ebay for as much as 70. USD which blows my mind since they probably sold originally in Japan for a couple bucks at most. Listen samples here (flash needed). Oh my god those Cagliostro recreations are so amazing. 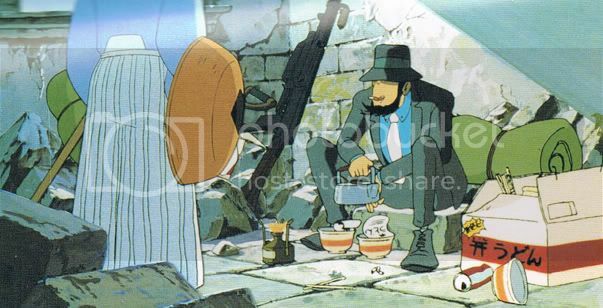 I'd like to find some of those for other Lupin Movies. Like Mamo or Dead or Alive. It's mind boggling to think that in the Grand Scheme of Lupin, it's a 31 year old Movie keeps getting figures constantly. I personally would rather them make figure sets specific to the newest special every year. Awww. No Pops? But still cool none the less. 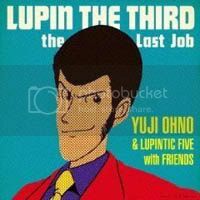 Love seeing how marketable Lupin is in Japan. I'm actually more interested in that Black Jacket one. Something very unique looking IMO. Nice to see that the 40'th Anniversary one isn't the only one we'll ever see. 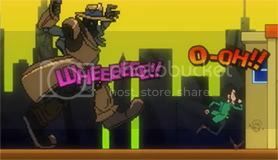 i don't know if someone has seen this before, but it's curious, and funny. Pics of Gachapon and Roots figures here. Lupin figure with hipster glasses. Oh, and Fujiko likes to play doctor. Sadly, I mean that literally. Oh, and Fujiko likes to play doctor. Sadly, I mean that literally.